The full release of this techtrance anthem is on the 18th May 2015 via Mark Sherry’s Outburst Records including a Tempo Guisto Remix. It has already been featured in many of Mark’s recent live sets, for example #ASOT700 in Utrecht or his North America tour. Also supported by Ben Nicky, Guiseppe Ottaviani, Jordan Suckley, Alex M.O.R.P.H., Eddie Halliwell, Solarstone, Marco V, Judge Jules, Ben Nicky, Eddie Bitar, James Dymond, Arctic Moon, Alex Di Stefano, The Space Brothers, Manuel Le Saux, Ian Standerwick, Johan Gielen. Corti Organ are really starting to make waves in the scene and get the support that they deserve! After the success of their huge techy collab with Max Graham FYC 2014 last year and their recent Armin supported release on ASOT called Butterfly, we were already keeping an eye on these young Croatian and German producers! 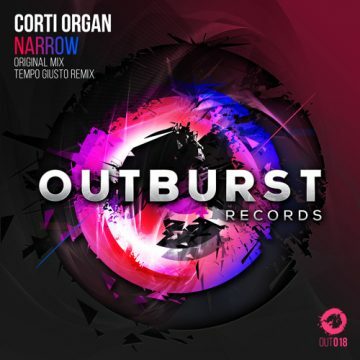 Their debut release on Outburst arrives in the form of the absolutely lethal tech-trance anthem Narrow, which was played by Mark at ASOT700â€¦ and every single one of his gigs since! With itâ€™s BXR meets Ricky Fobis/Igor S kind of old school tech vibes this is an absolute club destroyer, and with the label-favourite Tempo Giusto on remix duties, we really donâ€™t need to say anything else â€“ just get onto this!